The 2017 USA Sieger Show was held in Atlanta, Georgia on April 21st through the 23rd. We are proud to announce that Roche’s Amara Vom Roche finished VP8 and Apollo Vom Roche finished VP 3. Both Amara and Apollo were the youngest in their class and we could not be more excited at how well they performed at the show. This three day event is a competition between registered German Shepherds and is open only to those dogs registered in the USA Breed Registry or another FCI recognized breed registry. Pedigree and registration papers are required to enter the competition and acceptable training titles include the following: HGH, DPO, IP, SchH and any others considered acceptable by the Breed Advisory Committee. The dogs are separated by age and judged based on both performance of specific skills as well as their structure and anatomy. Cash prizes are awarded along with titles and trophies. More than awards, the honor of placing at a sieger show is of great worth to any German Shepherd owner or breeder. Shows like the sieger show exist to keep the German Shepherd breed in high esteem. Each show has differing rules, regulations, and titles, but the goal is to protect and champion the value of excellent German Shepherd breeding and training. In German, the word “sieger” means champion. 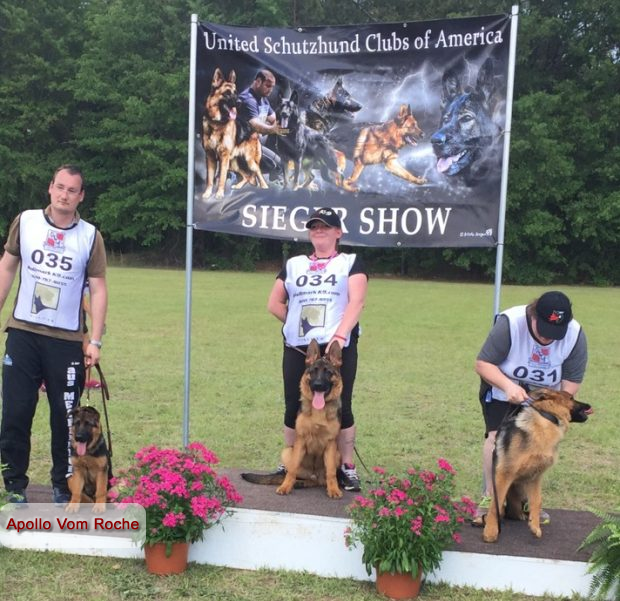 At Roche’s Pedigree German Shepherds, we’re training champions and the recognition and excellent finishes at the USA Sieger Show by our Amara and Apollo are proof of that. For more information about our breeding dogs or to add a world class German Shepherd puppy to your family, contact us today.